Anyone who has studied the history of vaccines will know that the sharp drop in diseases since the 1940s was primarily attributed to the following: sanitation/hygiene (garbage collection, clean water, soap), refrigeration, and nutrition (readily availability of food). Contrary to the pharmaceutical industry's propaganda, vaccines did not make people healthier. In fact, there are many studies across the world that demonstrate vaccines actually cause the very illness and disease they were intended to treat. Why haven't scientists announced that most of the children afflicted with measles and mumps are the very same children who were vaccinated? One study showed that 97 percent of children afflicted with mumps had already been vaccinated against mumps. In 2010, a mumps outbreak spread in New Jersey, and 77 percent of children afflicted with mumps had already been vaccinated against mumps. The same is true with measles. Most measles outbreaks spread among those who have been vaccinated against measles. When a swine flu outbreak swept through Britain in 2010, it turns out that 70 percent of those infected had already been vaccinated against swine flu. Modern humans can trace their root as primates back to about 65 million years in the savannahs of Africa. We've survived and multiplied during those millions of years without the need for vaccines and other pharmaceutical drugs. Now, we're told we need several shots of vaccines every year to remain healthy. What has changed? We're caught in the quagmire of capitalism, to the point it's becoming every person for themself--those who are uninformed will live a life of misery under the medical-industrial complex. The system has become unsustainable and corrupt. The CEOs of these multibillion dollar pharmaceutical companies are probably good people, just working in a rotten system. These CEOs are responsible for their shareholders/investors; most of these investors in turn are money managers who manage money for pension funds, wealthy clients, governments, and mutual funds. One can only imagine the pressure these CEOs have to endure. They need to increase sales and profit, even if it means selling things that people don't need or want. If they spend $10 on marketing and (legal) bribery and expect a return of $40, isn't that a good investment? Of course it is. Just follow the money trail. Without knowing it, you may be a part of this rotten system. Your mutual fund, index fund, and most importantly pension fund (union pension, teachers pension, retirement fund) may hold stocks in these pharmaceutical companies. Furthermore, your favourite TV shows are financed, through advertising, by the pharmaceutical industry. The next time you watch a show, newscast, or sporting event on television, notice how many drug ads there are. For this reason, you rarely hear the truth about vaccines and drugs on television, or the newspaper. The vaccine industry was about $23 billion in 2014 and expected to reach $42 billion by 2020. That's big business. The pharmaceutical industry as a whole is BIG Business, thus the moniker Big Pharma. 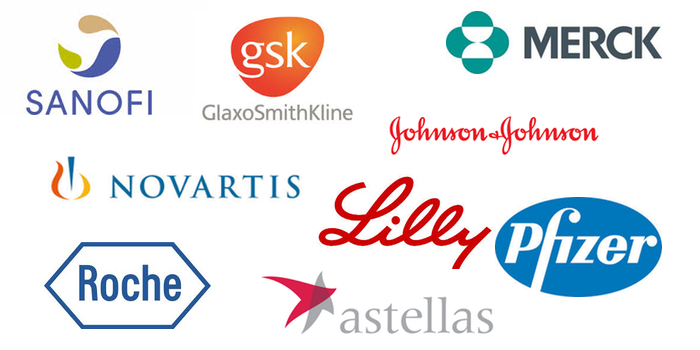 Below are some of the largest pharmaceutical companies in the world, as of October, 2014. After looking at these numbers, you'll understand why they're called BIG Pharma and how it is that they're able to steer and dictate public health policies. Almost every single public policy pertaining to drugs and vaccines was drafted by the pharmaceutical industry--it is able to do this by showering money on those it seeks to influence. Big Pharma's sphere of influence, from journalists to doctors. ---and consumers (mass advertising, fear-mongering/scare tactics through media). Under US law, a pharmaceutical company can contribute up to $50,000 a year (usually in a form of consulting fee, research grant, services rendered, etc.) to anyone in the medical field and it is perfectly legal. Anything up to $50,000 a years does NOT constitute a conflict of interest, therefore it does not have to be reported to an ethics committee. The state of medicine has deteriorated to the point that it is taken for granted that you can't find experts who aren't on the take. --Dr. Howard Brody, on physicians and others in the healthcare industry. The constant barrage of hysteria on television to get people vaccinated is no accident. It is meticulously planned with Big Pharma's alliances with TV networks, journalists, doctors, health officials, and politicians. It is a sophisticated form of marketing that has one purpose: increase revenue. If the pharmaceutical companies have something worthwhile to sell that people needed, they wouldn't need to force it on us. For example, a farmer doesn't need 2 lobbyists for every US member of congress to convince people that they need to eat food. However, the pharmaceutical industry does have 2 lobbyists for every US member of congress to convince us we need vaccines and drugs. At Pfizer I was expected to increase profits at all costs, even when sales meant endangering lives. --John Kopchinski, former Pfizer sales representative. Mr. Kopchinski won a $52 million qui tam lawsuit against Pfizer in 2009. The first legal duty of a public listed company: maximize profit for shareholders. Always do your due diligence before taking a drug or vaccine. There is no conspiracy at work, just follow the money trail. It's just business--BIG business. The Romans had a wise adage: Cui bono. Or "who benefits", "to whose benefit?" Merck made a "hit list" of doctors who criticized Vioxx according to testimony in a Vioxx class action case in Australia. The list, emailed between Merck employees, contained doctors' names with the labels "neutralise," "neutralised" or "discredit" next to them. It gives you the dark side of the use of key opinion leaders and thought leaders ... if (they) say things you don't like to hear, you have to neutralise them ... It does suggest a certain culture within the organisation about how to deal with your opponents and those who disagree with you. "Even worse were allegations of Merck damage control by intimidation," he wrote, ... "This has happened to at least eight (clinical) investigators ... I suppose I was mildly threatened myself but I never have spoken or written on these issues." The allegations come on the heels of revelations that Merck created a fake medical journal -- the Australasian Journal of Bone and Joint Medicine -- in which to publish studies about Vioxx; had pop songs commissioned about Vioxx to inspire its staff, and paid ghostwriters to draft articles about the drug. While conducting research on America’s media coverage of the Vioxx scandal, publisher of The American Conservative Ron Unz noticed some figures that seem to have escaped almost everyone else’s attention. The year Vioxx was introduced, 1999, showed the largest recent rise in American death rates. The year after Vioxx was pulled from the market, American death rates underwent a substantial and completely unexpected decline. "We find the largest rise in American mortality rates occurred in 1999, the year Vioxx was introduced, while the largest drop occurred in 2004, the year it was withdrawn," says Unz. "Vioxx was almost entirely marketed to the elderly, and these substantial changes in the national death-rate were completely concentrated within the 65-plus population. The numbers suggest that Vioxx may have caused more than 500,000 premature deaths. This is so far beyond the 3,468 that were named in Merck’s class action settlement for $4.85 billion in 2007 that it boggles the mind. Further investigation is clearly needed to determine just what effect Vioxx had on the almost uniquely elderly population that took it. And Merck needs to be held accountable for the colossal harms it has caused.